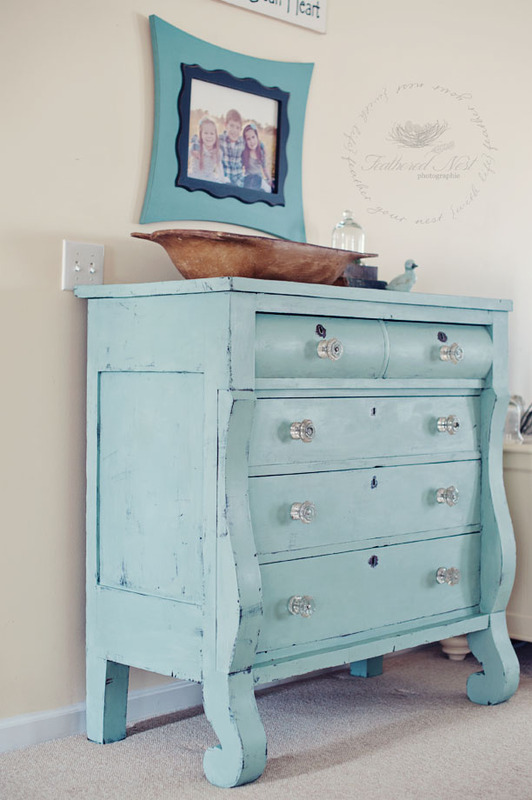 For this piece I knew I wanted something in my signature color...robins egg blue. 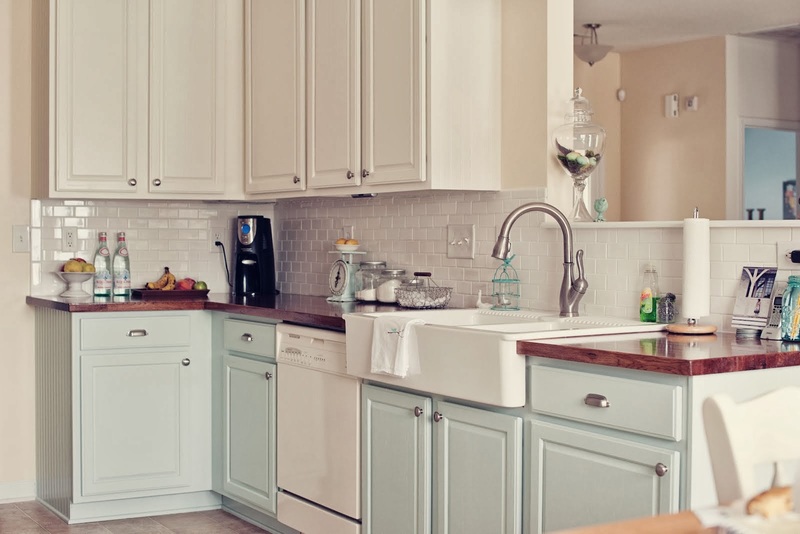 Anyone who knows me or who has been in my house will know how much I adore this color. 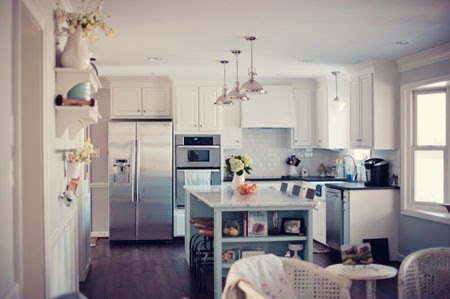 Have you seen my kitchen yet? 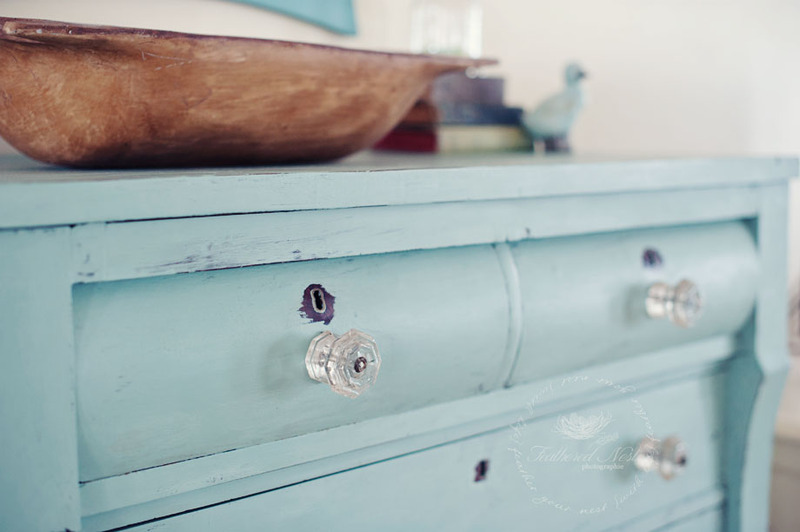 It just happened that Annie (Sloan) had the perfect color for me...duck egg blue!! Yay! 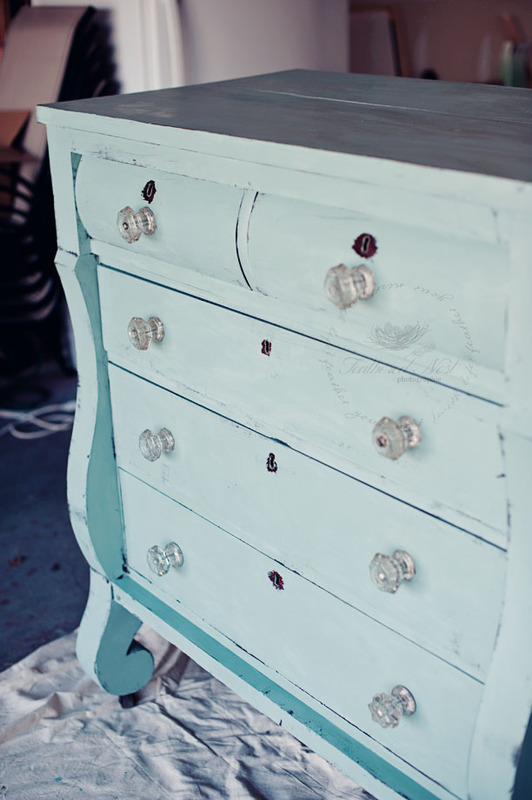 Here is a reveal of my stunning new (old) dresser. Enjoy! Here is the dresser before I got started. 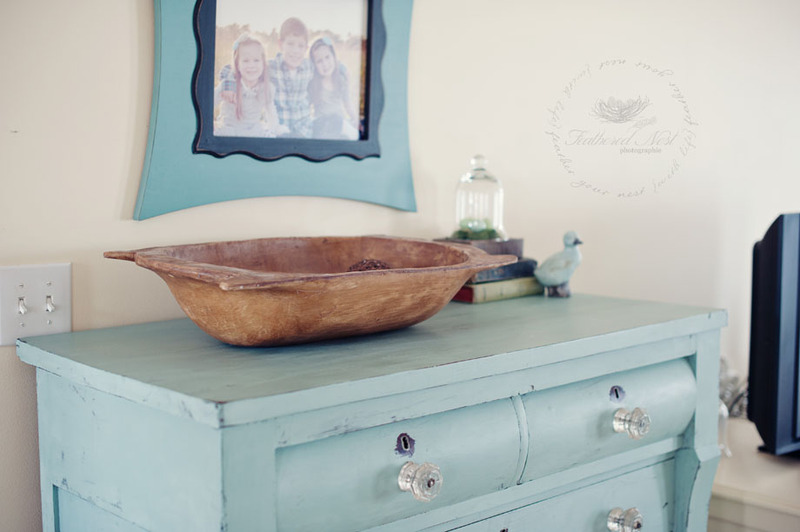 The wood tones were already beautiful however it had a large crack that stretched completely across the top that required immediate attention. I filled it with wood filler and sanded it down prior to doing any painting. These are the supplies I used for this project. 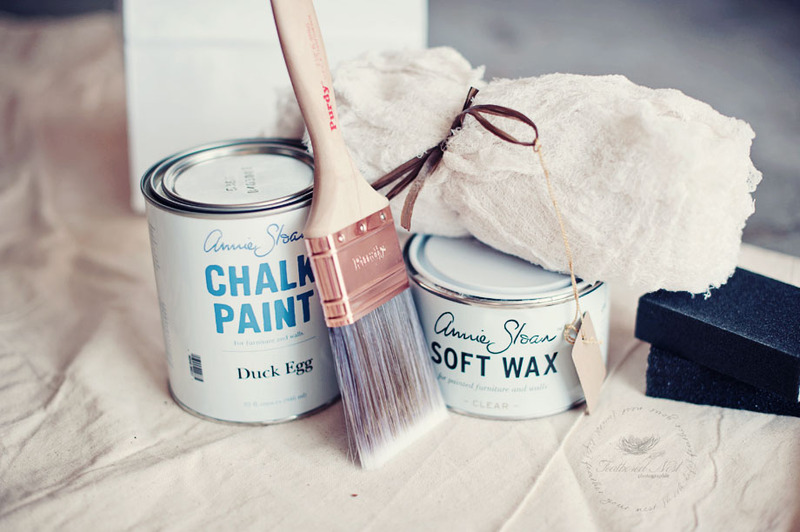 Annie Sloan Chalk Paint in Duck Egg, a Purdy paint brush ( I just couldn't spend $60 on the large Annie Sloan brush just yet), Annie Sloan clear Soft Wax, a bundle of cheese cloth for applying and buffing the wax (the Annie Sloan stockist had these as an alternative to the expensive wax brush) and one coarse and one fine grit sanding block. 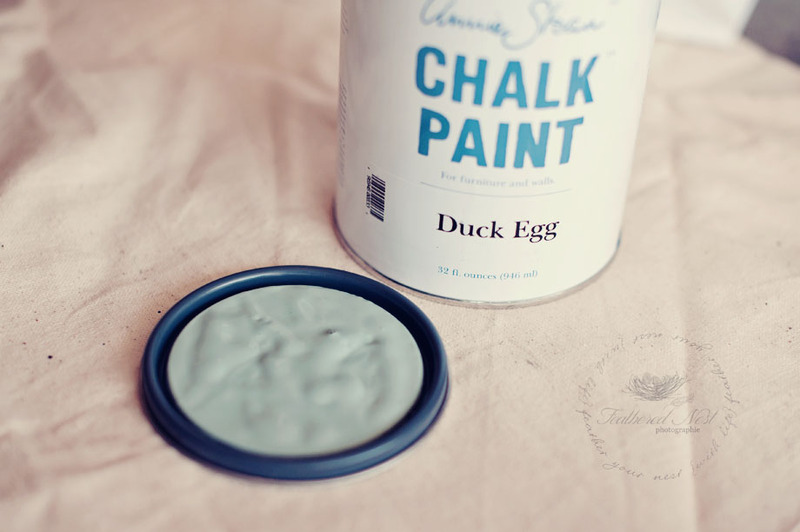 The GORGEOUS Duck Egg color! And this paint goes a long way. I only did one coat but barely made a dent in this can. 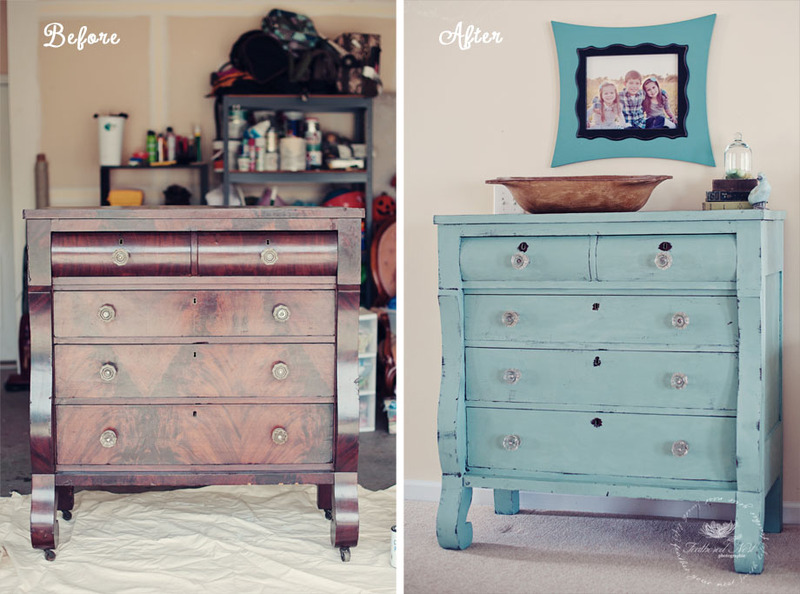 I can do many more projects with this same can of paint!! 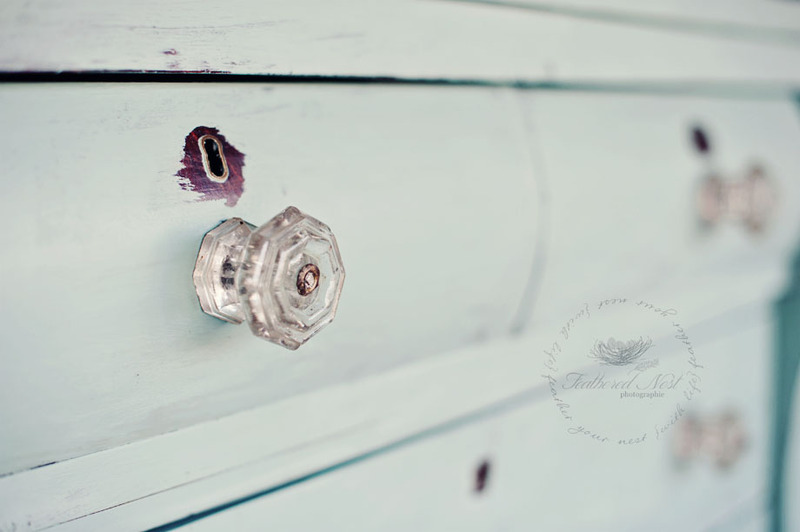 Don't you just adore these original glass knobs?! They were pretty dusty but after a quick wipe down with a damp cloth they sparkled. They still have that aged look to them where the glass has become a little discolored over time...however this is what makes them so pretty. Another view of the knobs. They all match except for the two on the bottom. Those are each different...another thing I love about them! You can see the one on the bottom right and the bottom left is almost a flower type knob. 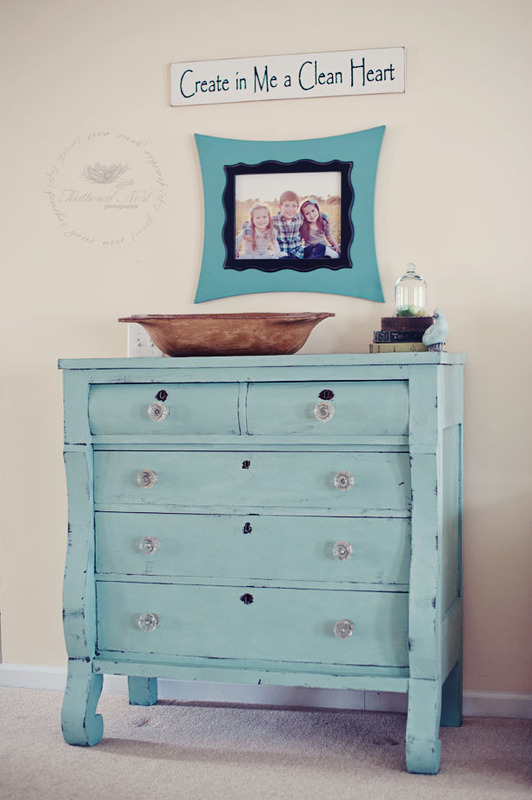 Here is the dresser in it's new spot in our living room. There was another piece of furniture here that has now moved to the other side of the room. The framed photo above may or may not be staying but I left it there for now. I have some decorating ideas but they will have to come with time. For now I just used some things I had laying around the house. An old dough bowl and some vintage books. I love decorating with old books. Here I stacked a vintage edition of Heidi, Puddn'head Wilson (Mark Twain) and the Holy Bible. 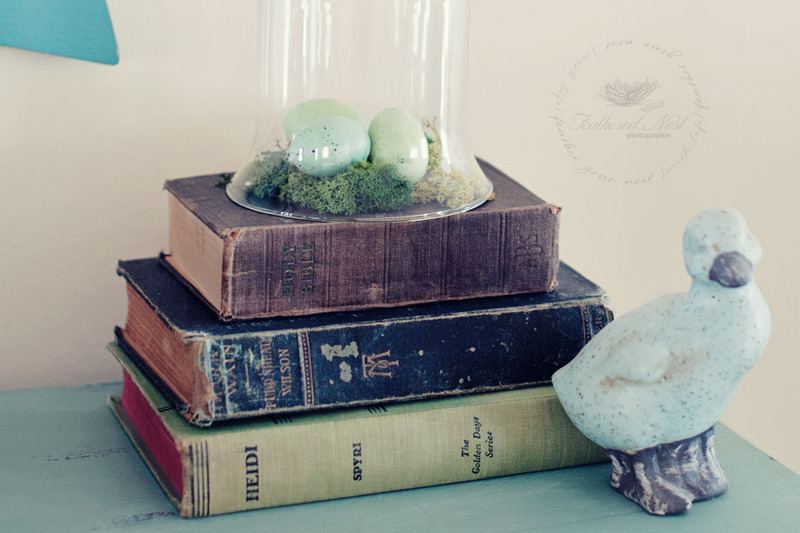 I placed a little moss and a few eggs on top of the books and covered them with a cloche to give a nice springtime feeling. The little blue duckling was an afterthought...he was sitting on a nearby shelf so I stuck him up there. A view of the side. She looks like she's got stories to tell with all of her dents and dings. The exact look I wanted. Considering that she really is an old piece the heavier distressing just fits. Her lovely curvy legs! 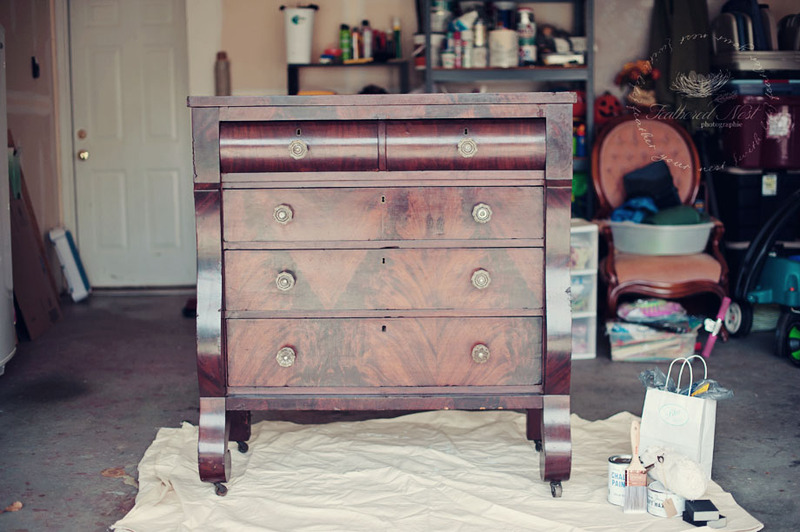 Funny story...my DH was helping me prep by removing all the knobs prior to painting and I mentioned how much I loved the lines of this piece. He then said, "well if you love the lines why are you painting over them?"... He obviously had no clue that by "lines" I meant the shape of the dresser, not the actual lines in the wood grain, lol! Bless him!! I had to laugh at him a little... but to give him some credit, the lines of the wood grain were beautiful too...just not what the word "lines" means when describing furniture. Well, there she is! I hope you enjoyed this before & after! Hopefully there will be many more of these! 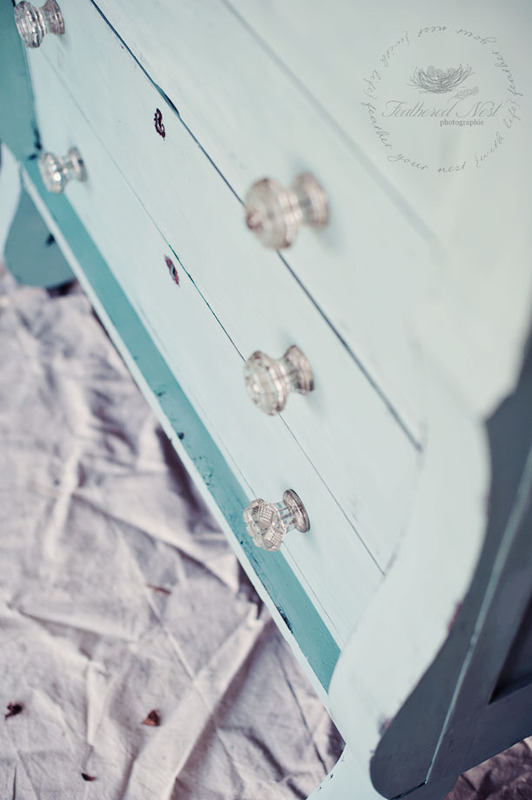 Have you ever painted with chalk paint? Feel free to leave a link to your project in the comments if you want. Happy Monday! Oh I love this! 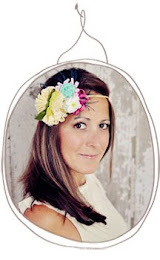 I am a big fan of Annie Sloan paint! Hi Lauren :) Thank you! Sure! 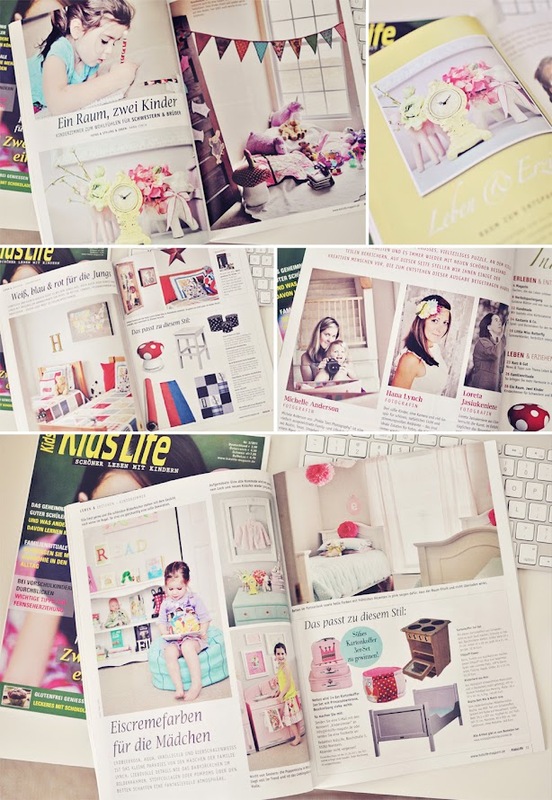 Would love for you to share it! 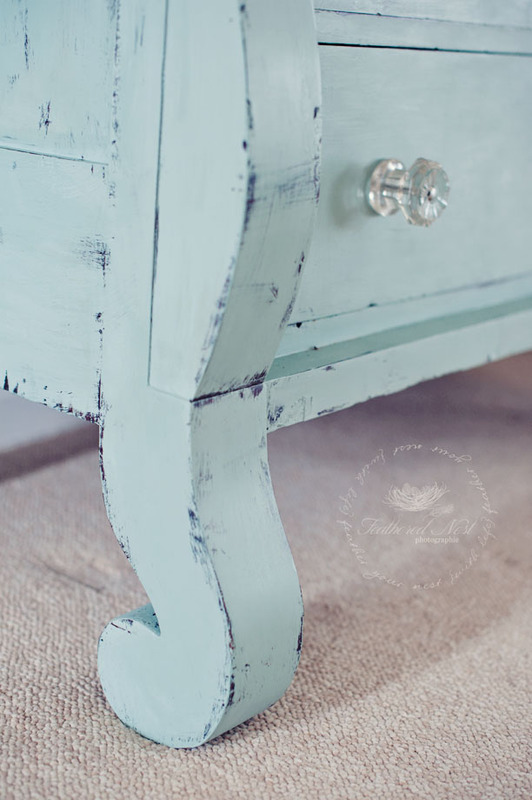 This was my first time experimenting with chalk paint and I'm in love! This is SO cute! You could totally start your own business! Love it! Hi Ali! Thank you so much! Maybe I'll pick up a few more craigslist pieces and then resell them :) I think I could have a lot of fun with this paint! Thanks for stopping by!